September just passed by, it makes you wonder how on earth did a month flew by so fast? Even though we live on a day-by-day basis, but before we even realize, October is coming soon. And when it comes to October, it's all about prepping for Halloween and getting psyched for my post-Halloween giveaway, coming up towards the end of October. But anyway, let's focus on September for now in this much awaited post. Initially, I didn't want to chase after BreadTalk, but after a serious discussion with my mother who raised the issue of responsibility and integrity. I decided to pursue BreadTalk, also partly because Yi Teng was also a victim of BreadTalk's "technical glitch". Let's face it, you make a mistake, you own up to it and settle it as soon as you humanely possibly can. It goes to show that you care for your customers. But noooo, when Yi Teng first emailed BreadTalk, they tried to shake her off with "It's a technical glitch issue". Like seriously, there has to be a someone manning the corporate email. How can a person's carelessness become a technical glitch when the person involved doesn't even know a single thing called "checking" or "proof-reading"? Anyways, they tried to stall Yi Teng to the point where she almost gave up. And that's when I took over the "I'mma chase you and hunt you down to the ends of this planet until I get my prize". Besides, BreadTalk claimed that me and Yi Teng won, therefore they should have the courtesy of replacing the mooncakes with vouchers, without even having us nag at them. Current status? Still awaiting the marketing-in-charge dude to get back to me and Yi Teng with regards to our vouchers. Anyhow, let's just stick to happier things such as sample collecting for the month of September. In case of any miscommunication, I can still carry on shaming BreadTalk in this space here. Hmph! 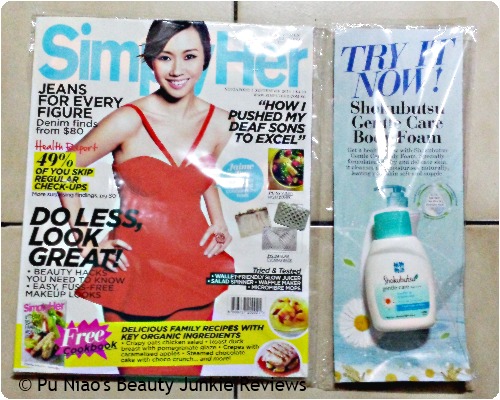 I was browsing around 7-Eleven after paying my phone and credit card bills when I chanced upon a copy of Simply Her and they had a Shokubutsu Body foam sample giveaway. The magazine wasn't even expensive in the first month and since it's only that 1 magazine I would buy just for the sake of the sample. I got a copy. 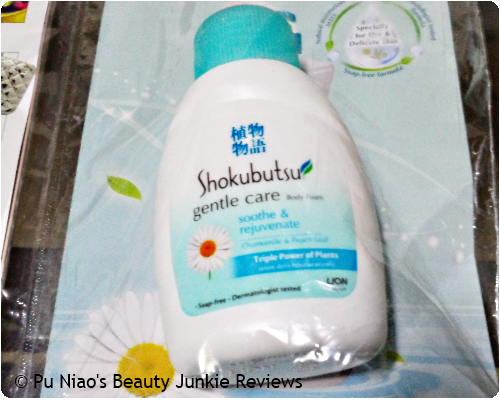 I've seen Shokubutsu shower foams from when I was a teenager, but my mother disallowed me from buying a bottle because she heard from her friends what it doesn't seem to wash off thoroughly. The truth is that, it's because your skin is moisturized from the shower foam, hence it feels as if it cannot be washed off thoroughly. 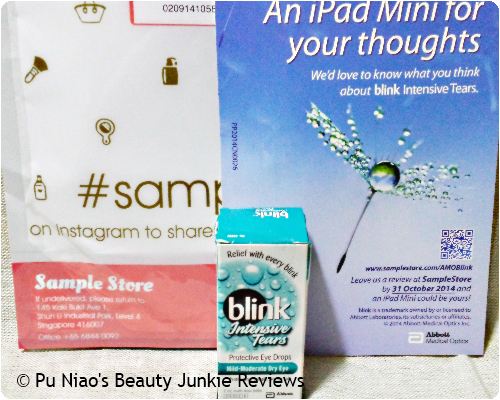 WHERE TO REDEEM SAMPLE: Old issues have been recalled back, you might have to get back to Singapore Press Holdings for back/old issues and check if the samples are still available. 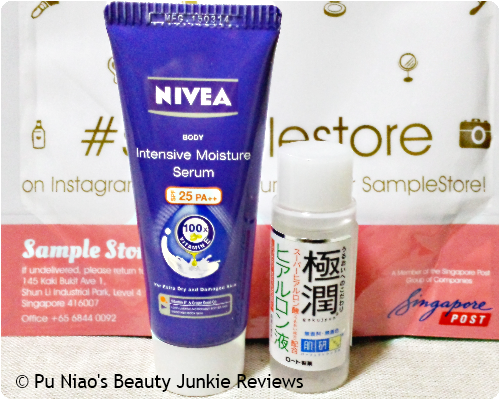 The Sample Store previously had a Nivea sample up for grabs, but when I tried to redeem it, it claimed that I had redeemed it before. Which I probably did and forgot about it LOL Anyways, I got a nice surprise when I received the sample despite the website not allowing me to, alongside with an additional Hada Labo sample. WHERE TO REDEEM SAMPLE: Stocks are fully redeemed. WHERE TO REDEEM SAMPLE: Redemption is over. Went to JEM Sephora to stock up on my foundation powder, but they were sold out :( They are always sold out whenever I have to get a new foundation, why oh why? Anyway, I browsed around the hair section as I know they have one there. 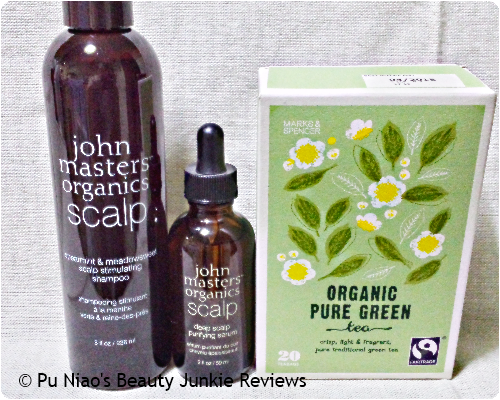 And stood in front of the John Masters products for a good 30 minutes. 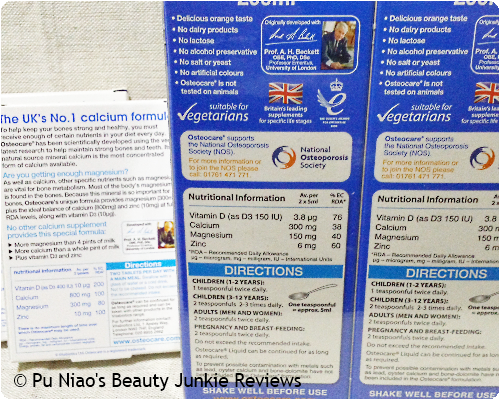 Seems too good to be true and on-the-spot product reviews I pulled from the Internet seemed to suggest that it's a product that really works, so I grabbed a stimulating shampoo and the purifying serum as well. Along the way, if you have a membership with JEM and spend at least $80 or $90 on the day itself, you can redeem a box of Organic Tea (which was redeemable from Marks & Spencers LOL). WHERE TO REDEEM SAMPLE: Not sure if there's anymore "minimum" spending rewards are still available on the last day of September though. You might want to check beforehand before spending. Gerber's was hosting a sampling activity, and sometimes, I just love trying kiddie food. 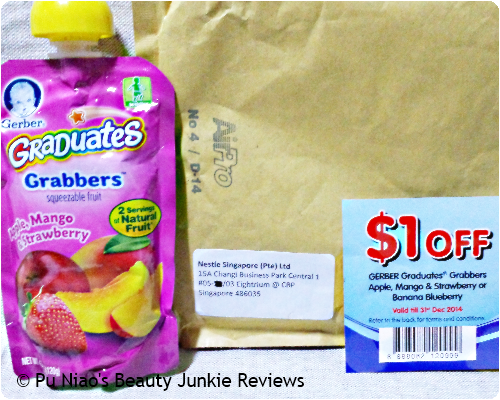 Simple and fuss-free, yep, I am lazy when it comes to eating too ^^; I got the Gerber Graduates Grabbers Apple, Manga & Strawberry flavour @ 120g. WHERE TO REDEEM SAMPLE: There are still stocks left for redemption over at The Sample Store. 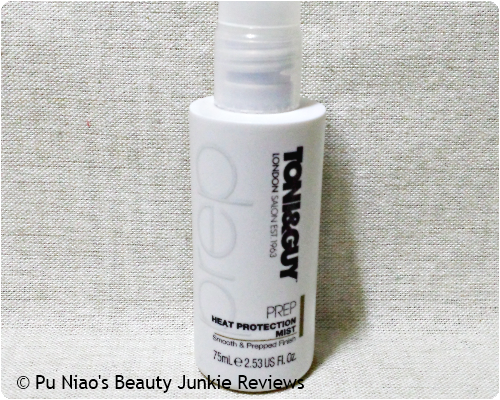 John Frieda Facebook page was previously hosting a sampling activity. 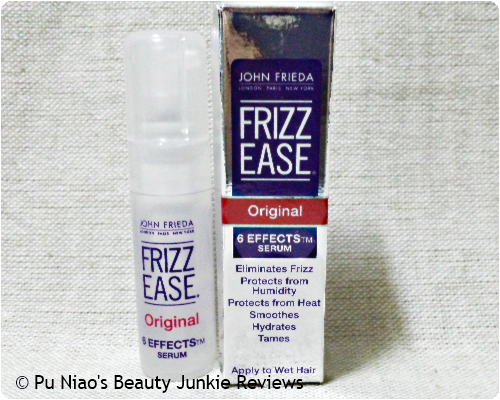 I redeemed a John Frieda Frizz Ease Original 6 Effects Serum @ 5ml. 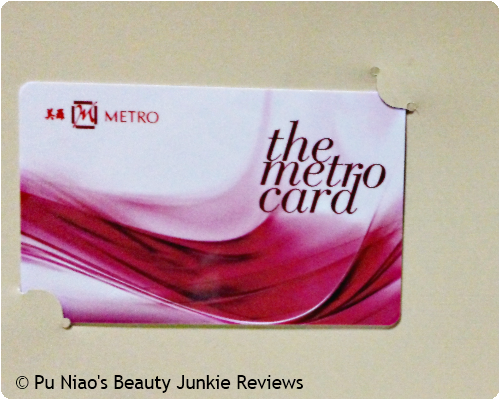 WHERE TO REDEEM SAMPLE: Go over to John Frieda Facebook page at https://www.facebook.com/johnfrieda.sg, Like the page as a fan first. Next, click on the Redeem a Sample link. Simply fill up your particulars, answer some simple questions and they will mail the samples to your mailbox. WHERE TO REDEEM SAMPLE: Sample Redemption is over. SilkPro Silkbath was previously hosting a sampling activity. 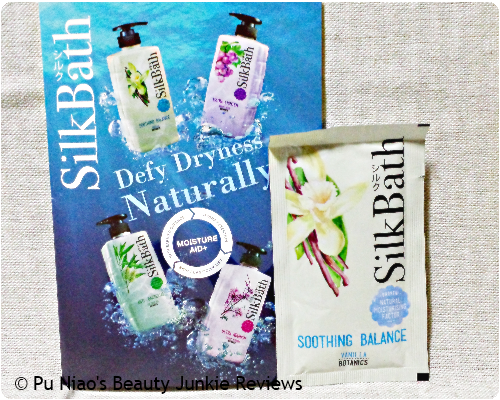 I redeemed a SilkPro SilkBath Soothing Balance Vanilla & Blue Daisy sample sachet @ 10ml. WHERE TO REDEEM SAMPLE: Go over to https://uvaquawhite.typeform.com/to/txVjmP and fill in your details + a really short survery/questionnaire. Wait for the sample to arrive in your mailbox. 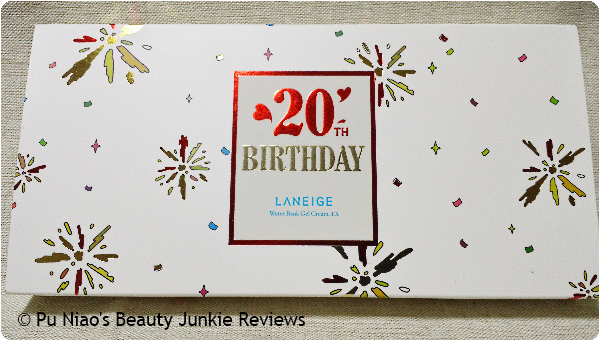 I was one of the lucky winners for the Laneige Birthday wish contest on FB. After a few emails confirming with Laneige on my real name, IC number and whatnots for easier identification as I'm using an online alias. Collecting my prize was a breeze. Although unfortunately, I managed to arrive really close to lunch-time, so, going up was a breeze but leaving the building was really mind-boggling. So many people in the lift!! Here's a look at the back of the product won. Recommended servings as stated on the back. Besides, who the hell goes for a 2.5 hours lunch break? My lunch/dinner break is only 45 minutes. I just felt like answering her with "Please take note of your ulu location next time" every time she end her sentence with "Please take note of the time". Even if there's only 1 person in-charge of the prizes, the person-in-charge should at least delegate someone else to take over in the event of a lunch-break, isn't it? 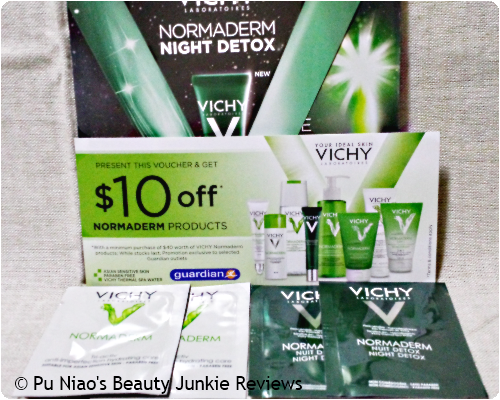 WHERE TO REDEEM SAMPLE: There's always new contests for different health products on a monthly or bi-monthly basis. Dove was previously hosting a sampling activity for their latest and newest released hair product. 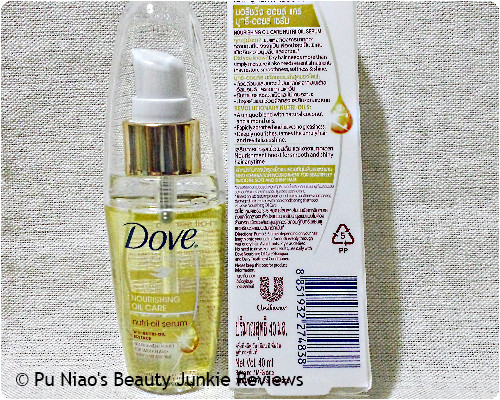 I redeemed a Dove Nutritive Therapy Nourishing Oil Care Nutri-Oil Serum with Nutri-Oil Essence @ 40ml. 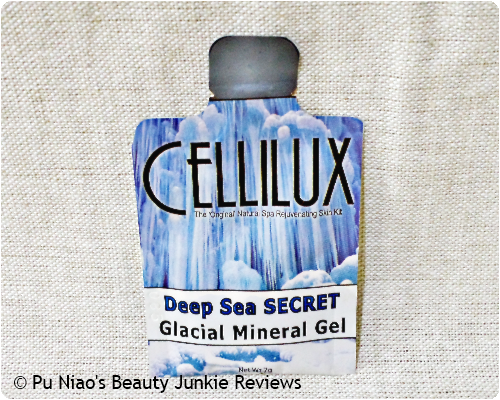 Celilux Deep Sea Secret Glacial Mineral Gel: Cellilux provides an alternative to acids and damaging chemicals that rule the world of skincare and beauty treatments. Their Glacial Mask is a truly groundbreaking treatment that provides multiple benefits in one application. 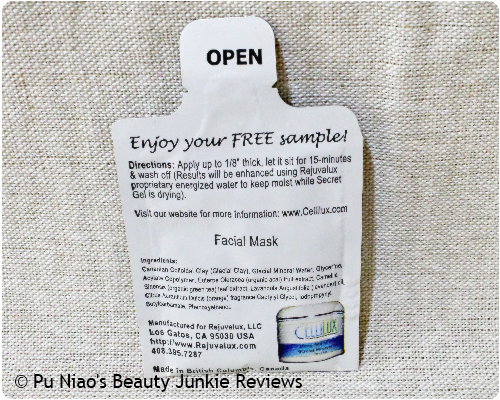 Four major technological skincare methods are at work each time you use the mask. First, a specially structured water deeply penetrates your skin for intense hydration not found in any other product on the market. 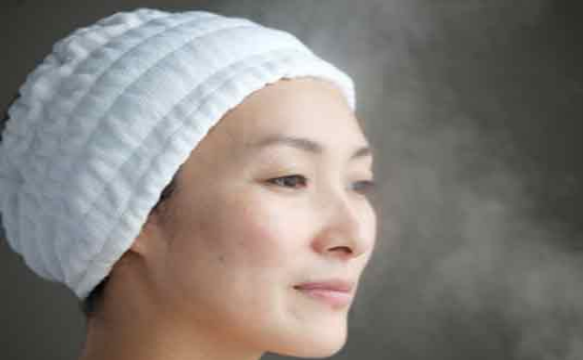 Second, special minerals detoxify your skin by bringing all of the impurities to its surface. Third, those same minerals actually work with your DNA, instructing your skin to activate youth-bringing processes such as collagen production. Your skin is revitalized like never before. Finally, the mask works as an exfoliator to lift away the detritus that's been cleansed from deep within for skin that glows with the health of youth and is devoid of clogged pores. With technology that harnesses mother nature to provide a natural alternative, the Glacial Mask must be used to be believed! Cellilux contains natural catalytic molecules that are negatively charged. These negatively charged ions are able to draw positively charged bacteria and impurities lodged deep within the skin as well as neutralizing free radicals. 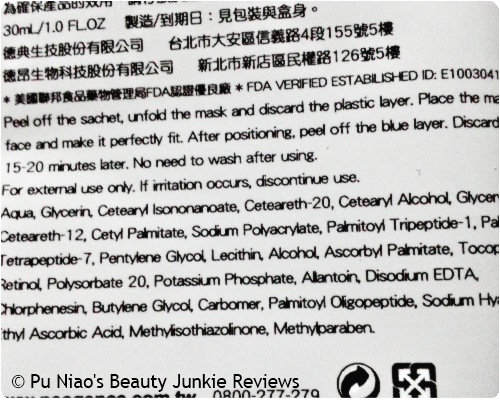 Due to the reaction between these ions, you might experience a slight tingling sensation when the mask is applied. This sensation should fade away in a few minutes. The product actually looks a little clumpy like clay when I first squeezed it out of the satchet itself. And believe it or not, it actually does spread decently well despite the clumpy clay-like consistency and texture. 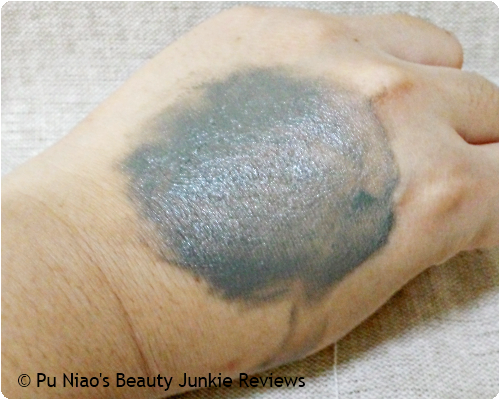 Despite the initial first look at the product itself looking so clumpy and clay-like, or should I say cement-like, I find that it's really easy to apply and it spreads evenly on my face efficiently without having to break into a sweat. 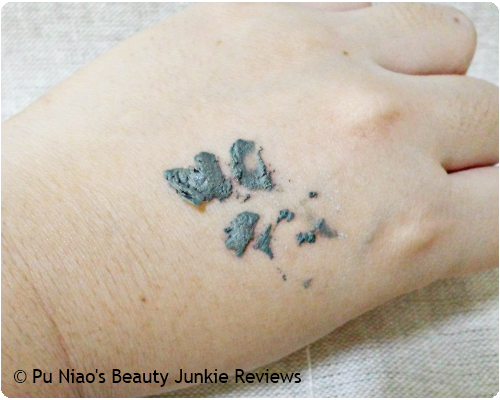 It just so unfortunate it looks like clumpy cement, but the spreadability is just so awesome that I was really surprised when I tried to spread it evenly on my face the first time. The gel/mask literally glides onto your skin right as soon as you spread it out and it gives out this cooling sensation during the application process. Immediately after applying a layer on my face (Since I accidentally applied a not so thick, but still a thick layer on my face the first time round, let's just call it "a layer on my face" for the duration of the post), I got this warming sensation. As I've used quite a generous amount on my face the first time round, it was more like a burning sensation that slowly subsides. But the 2nd time, I applied a really thin layer instead and it was actually a comfortable warming sensation. 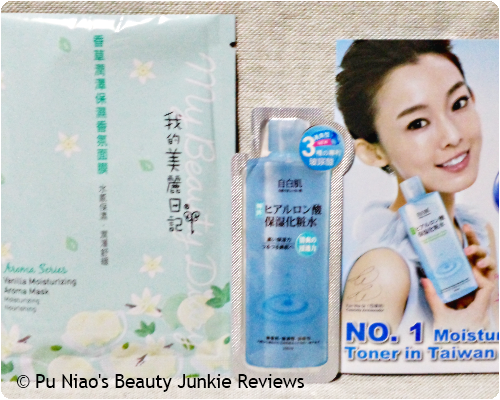 It felt as if my pores were opening up and all that gunk in my pores are being cleansed thoroughly. Oh yes, that elusive comfortable warming sensation really gives you that impression even though you might not be aware of how it's doing what it does. 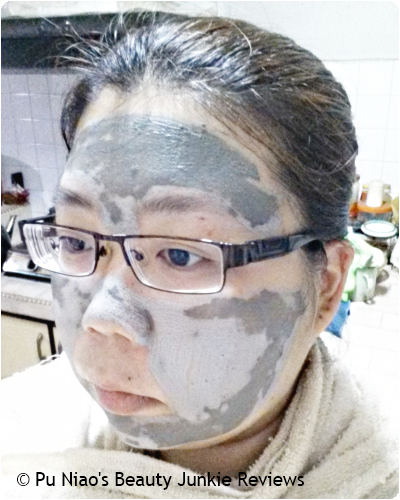 Most clay masks feel pretty much the same, a warming or burning sensation when applied onto the skin. But depending on the type and how thick or thin the layer is, it can either be a really comfortable warming sensation or an intense burning sensation. So, tread with caution with applying clay masks even if the packaging never states that there will be a tingling and/or warming sensation. 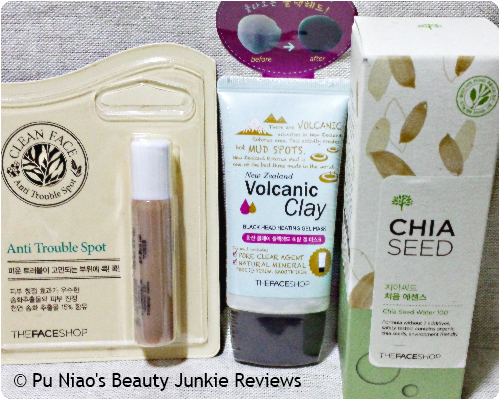 I've tried so many clay masks way before this blog existed that I can't name them all, I would bore everyone to death somehow. And most clay masks starts with a tingling sensation before moving onto the really heaty sensation that is close to burning. But this product when applied correctly just simply gives that warm, comfortable warming sensation that almost lulls me to sleep without me knowing. When the mask is all dried up, it feels tight and a little wetting of the mask ensures it can get washed off much more easily than just splashing and directly trying to rinse it off. And as soon as the gel/mask is washed off, I immediately noticed that my skin looks so clean and clear. I can't say about glowing complexions as I go to bed with my head on the pillow only to wake up with the pillow resting on my face instead. God knows what happened when I was sleeping? However, I can say that facial products I applied on my face immediately after rinsing off this gel/mask, such as moisturizer for example, seems better absorbed than usual. There wasn't this oily and glossy looking skin 30 minutes after the moisturizer application. 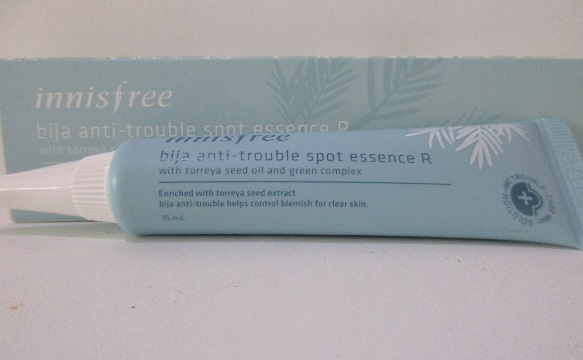 And it did help to lighten up some of my old acne scars and blemish marks too! WHAT I THINK: Despite the hefty price tag, I think this product actually does work on the first time round. It's like having an expensive facial, but in the comfort of your own home. Definitely worth it! 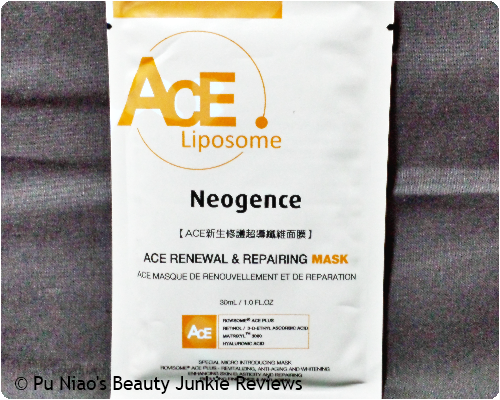 Ace Liposome Neogence Ace Renewal and Repairing Mask: ROVISOME® ACE PLUS - revitalizing, anti-aging and whitening. 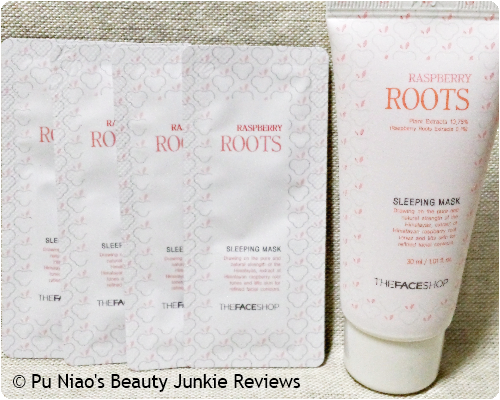 Enhancing skin elasticity and repairing, reducing fine lines & anti-aging. Special micro introducing mask material plus micro emulsion formula. 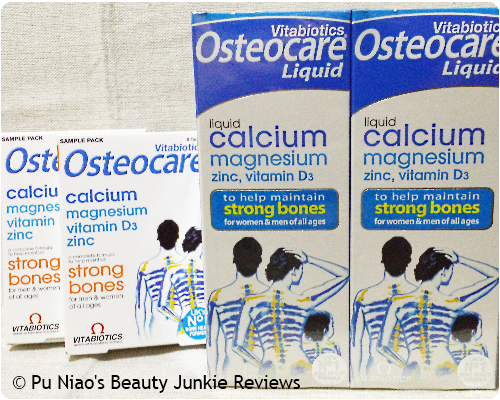 Multiple vitamin ACE formula penetrates deep into the skin to block melanin formation and restore the skin back to its even and bright tone at the same time. 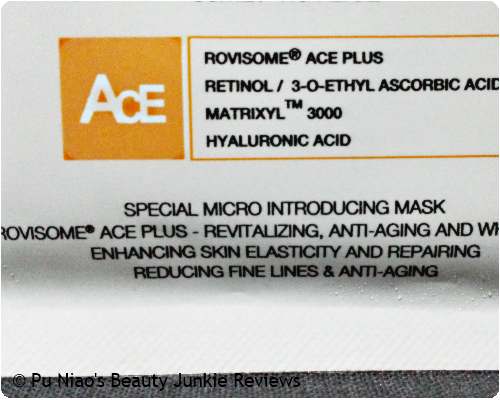 ACE RENEWAL & REPAIRING MASK contains MATRIXYLTM 3000, a powerful peptide complex has anti-wrinkling and lifting effects. The intensive microemulsion essence can be absorbed quickly and refine skin texture to appear softer, smoother, noticeably brighter. Detailed instructions on the proper usage of this mask. The mask comes with an extra blue layer of plastic, which is supposed to make it easier to align on your face. But I just find that it's cumbersome and troublesome. Not to mention I had A LOT of difficulty in trying to adjust and align the mask properly onto my face with that extra blue layer of plastic obscuring and obstructing. And the mask kept slipping off my face as I desperately tried to peel off that darn blue layer of plastic. Finally got the mask onto my face by actually removing the entire mask off my face, peeling the blue layer off and re-applying and re-adjusting the mask without the blue layer. Argh!! 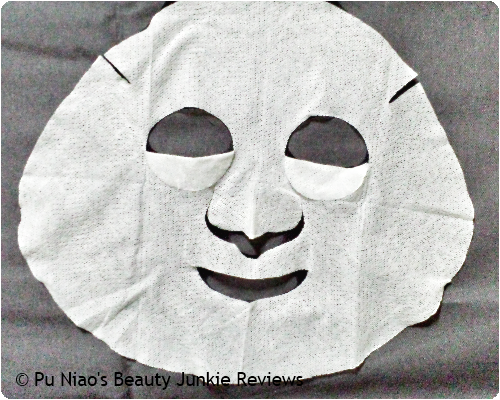 VERDICT: Basically, I'm someone who goes ridiculously mad when it comes to facial/paper masks such as this one. On a monthly basis, I can spend up to $100 just solely on masks and I don't buy 3 - 4 boxes of the same type, mind you. I buy a different box for each skin troubles and woes I am facing. 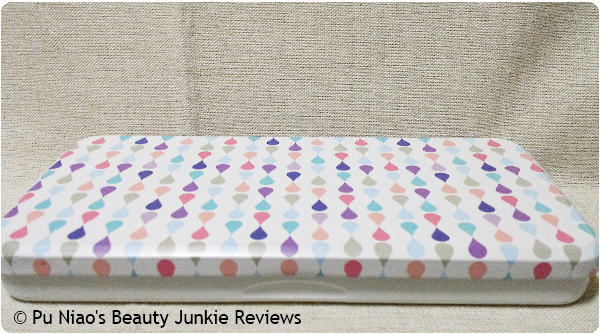 Such as one box meant for tightening of pores, one box meant for moisturizing and calming purposes, another box for brightening and renewal. Hence, a few boxes ended up costing close to $100. And I hadn't even mention that extra few hundred on collagen drinks, pills and jellies yet :( Anyways, I'm game enough to try new masks I see as long as it's actually meant for my skin-type. The scent of this mask isn't so bad, although I can't really put my finger on what the scent itself reminds me of. So unfortunately, I'll have to give the scent/sniff test a miss this time round. 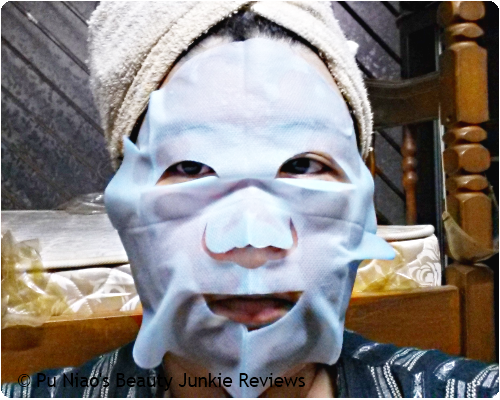 The mask itself is really thin, comparable to a 2-ply tissue when thoroughly wet. But the good thing is that, it doesn't tear so easily if you were to just tug it a little gently while trying to adjust the mask on your face properly. I find that it covers my nose entirely without leaving any gaps in between. The only downside is that because it's so thin, it has to seemingly be secured properly with this blue plastic layer which I personally find annoying throughout using this mask. First, I did what the instructions stated, to align and adjust the mask on my face properly. But the blue plastic layer was practically aiding the eye flap area in obscuring my poor vision that I ended up pulling the mask off my face, peel off the blue plastic layer before re-adjusting the mask back onto my face. Did I mentioned that this is the first time I was spewing so much profanities (very softly, of course) while trying to apply a face mask? After around 20 minutes, I removed the mask and could see clearly that the red areas on my face looked so much calmer than before. And there's no sticky residue or sensation on my face, something that most masks always seemingly somehow does. My face also looked smoother and clearer, although I can't really tell much about the whitening effect as I personally have a pale-like-a-ghost skin-tone. 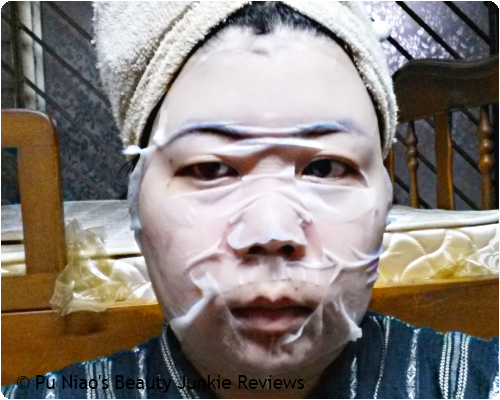 The only difference is the blemish marks and acne scars that I already have on my skin, which frankly speaking, does look a little lighter prior to using this mask. 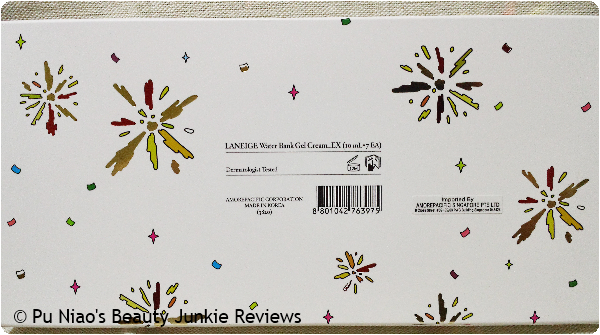 WHAT I THINK: Overall, I really do like and enjoy using this product as it reduces the redness on my face. But, that blue plastic layer is putting me off from permanently buying this product in the long run. 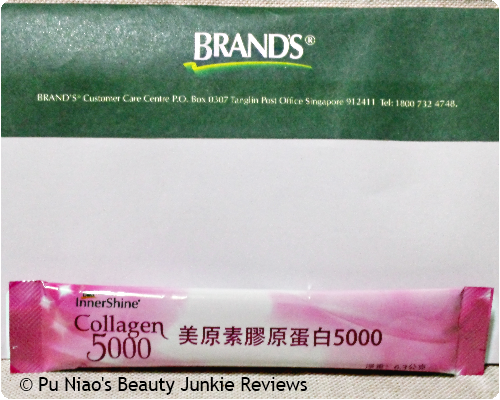 WHERE TO REDEEM SAMPLE: I redeemed this sample from The Sample Store.